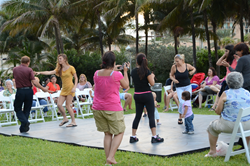 October events in Sunny Isles Beach will kick off with the Taste of Sunny Isle Beach on Sunday, October 4, continue with a lunch and learn on October 12, plus the rescheduled Sunny Serenade on Saturday, October 24. The month will conclude at the City’s annual two-day Halloween event, Booogie by the Beach, on October 30 and 31. The delicious Taste of Sunny Isles Beach will take place on Sunday, October 4 from 5:00 – 8:00 pm at Heritage Park (19200 Collins Avenue). Join in celebrating the diversity of Sunny Isles Beach, with an array of local restaurants selling specialty dishes from around the world. Tasting portions at affordable prices enable patrons to eat their way around the park. There will be something to satisfy all appetites. Also get a taste of the atmosphere that is Sunny Isles Beach by enjoying a live performance by winners of this year’s SIB Talent Show. Admission and parking are free and open to the public. Free parking is allowed in the garage or under the William Lehman Causeway. Residents may also hop on the SIB Community Shuttle Bus to and from the event. At Pelican Community Park, on Monday, October 12 from 10:00 am – 1:00 pm, the Osher Lifelong Learning Institute (OLLI) will hold “Politics is news – all the time”, a Lunch and Learn Event. Presenting the material will be Dr. Kurt Stone. Groucho Marx once said, “Politics is the art of looking for trouble, finding it whether it exists or not, diagnosing it incorrectly, and applying the wrong remedy.” Dr. Stone will take us on an insider’s probe of the week’s stories, with an eye toward proving Groucho wrong. Dr. Stone – best-selling author, lecturer, political operative in Washington and California, “world-class news junky” – takes the stories apart. The “players” and the “sides” are uncovered, political implications emerge, and solutions may magically appear. OLLI Members and SIB Residents can enjoy the lecture for no charge, all other may attend for $10. Join the discussion. An RSVP is required by October 9. The Jersey Wiseguys will perform Saturday, October 24 from 7:30 – 9:00 pm at the original Sunny Serenade series location, Samson Oceanfront Park (17425 Collins Avenue). Chairs will be provided and a dance floor will be placed in front of the stage for those wanting to get into the swing of things. City staff is looking forward, at some point in the future, to holding a Sunny Serenade in the soon to be completed Gateway Park. For the Samson Oceanfront Park venue, vehicles may park in the City’s parking lot on 175 Terrace (behind the Walgreens). Booogie by the Beach will coincide with Halloween weekend this year. Come out for two nights of thrills and chills. Enter the costume and pumpkin carving contests. Walk through the famous haunted house for $1 per trip. Wristbands are now on sale for rides and games for $5 with SIB Resident ID Card and $10 all others. Stay informed on all that’s happening here by visiting sibfl.net, reading city publications or following the City on Facebook (City of Sunny Isles Beach), Twitter or Instagram (@CityofSIB) to learn the locations of future Sunny Serenades. For additional questions, please contact the Cultural & Community Services Department at 305.792.1706.